"EasyGuide"​ is a decentralized tourist platform that allows travelers from different countries to find fellow travelers, join companies of like-minded persons, jointly creating tourist routes and safely sharing the costs of this organization.EasyGuide, based on reviews and ratings, will group people according to similar parameters and make up an individual proposal for each of them. The Company and The Community. The Company is responsible for technological and business development that sustain and grow the Community, while the Community creates and oversees content, services, quality assurance, dispute settlements etc. The fees received from transactions will be divided between the two, where Community funds will be distributed through a Rewards Engine, so as to incentivize contributors that improve the ecosystem. The separation of these two entities is critical for the existence of a sustainable decentralized economy, that can both scale the community and assure the quality of its content and services. The Company facilitates the growth and sustainability of EasyGuide, overseeing marketing, product development, technological development, and business development. The team consists of professionals including developers, designers, and product managers, as well as experienced business and marketing leaders. 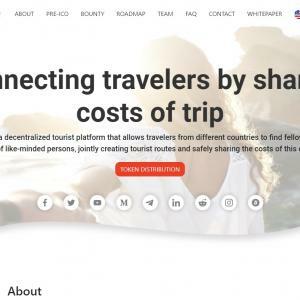 The Company exists in order to empower the Community to establish a valuable new travel ecosystem that creates value for travelers by offering a real alternative to the aforementioned problems in the centralized travel industry. In the early days, it will set initial community guidelines and facilitate gradual self-governance of the Community. The Community is an autonomous ecosystem consisting of Guides, Travelers, and other participants, as detailed below. Members of the Community will ultimately validate and approve new content and Services. The Community ecosystem will be powered by a Rewards Engine that rewards participants with tokens based on their contribution to the network. At first, some elements of the Community will be managed by the Company, including approval of new Guides and editorial tasks. As the Community matures and becomes capable of self-governing, the Company will gradually relinquish responsibilities.